Objective: The objective of the study was to describe the clinical, histopathological, and immunohistochemical profile of glioblastoma in patients and to correlate these findings with patient survival. Materials and Methods: Thirty cases of histopathologically diagnosed glioblastomas were included in this study. These cases were analyzed in detail for certain clinical and histopathological parameters. Immunohistochemical staining for p53, epidermal growth factor receptor, vascular endothelial growth factor, mouse double minute 2 homolog (MDM2), and Ki67 was done, and scores were calculated. Results of these findings were correlated with patient survival. Results: A retrospective analysis of the histopathology records and clinical case files was done in thirty cases of glioblastoma (World Health Organization Grade IV). The mean age of presentation was 50.6 years with a male predilection. The most common involved site was the frontal lobe. Among the clinical parameters, age of the patient and extent of surgical resection showed a significant correlation with the patient survival. Histopathological parameters showed no significant correlation with the patient survival, while among the immunohistochemical parameters, expression of MDM2 showed a significant correlation with the patient survival. Conclusion: In this study incorporating clinical, histopathological, and basic panel of immunohistochemistry, age of the patient, extent of the surgical resection, and expression of MDM2 showed a significant correlation with the patient survival. Glioblastoma is the most common primary brain tumor in adults, accounting for 15% of all the primary brain tumors and 60%–75% of all astrocytic tumors, with a median survival range of 1.5–2 years. Glioblastoma and its variants correspond histologically to the World Health Organization (WHO) Grade IV. In the WHO Classification of Tumours of the Central Nervous System (2016), glioblastoma has been classified into three categories: glioblastoma, IDH-wild-type; glioblastoma, IDH-mutant; and glioblastoma, not otherwise specified (NOS). Among the three, IDH-wild-type glioblastoma synonymous with primary glioblastoma is the most common and most malignant astrocytic glioma, accounting for approximately 90% of all glioblastomas; typically affecting adults (mean age at diagnosis of 62 years). IDH-mutant glioblastomas synonymous with secondary glioblastoma account for approximately 10% of all glioblastomas, manifest in younger patients (mean age at diagnosis of 45 years), and carry a significantly better prognosis. Glioblastoma, NOS encompasses the cases in which IDH mutation status has not been fully assessed. Overall, glioblastomas do exhibit significant clinical, pathological, and molecular heterogeneity. In this purview, this study was undertaken to analyze the clinical and histopathological spectrum of thirty glioblastomas received in our department over the past 5 years. The aim was to describe the clinical, histopathological, and immunohistochemical profile (Ki 67, p53, epidermal growth factor receptor [EGFR], vascular endothelial growth factor [VEGF], and mouse double minute 2 homolog [MDM2]) of glioblastomas in patients and to correlate these findings with patient survival. A retrospective analysis of the histopathology records and clinical case files was done in thirty cases of histopathologically diagnosed cases of glioblastoma (WHO Grade IV) received over a period of 5 years in our department. These cases were analyzed for defined clinical and histopathological parameters with some relevant immunohistochemical parameters. Clinical parameters included age, gender, clinical features such as signs and symptoms at onset, duration of symptoms, localization of tumor, treatment modalities, and role of adjuvant therapy. Histopathological parameters included the extent of necrosis, pattern of microvascular proliferation, mitotic activity, and presence of other components or variants. Immunohistochemical parameters included expression of p53, EGFR, VEGF, Ki67, and MDM2. The score was calculated as a percentage of positively labeled cells. Overall 1000 tumor cells were counted in systematically randomized fields throughout the section. Nuclear expression of markers was scored for p53, Ki67, and MDM2, cytoplasmic expression was scored for VEGF, whereas for EGFR, both membranous and cytoplasmic expression was scored. The expression for all immunohistochemical markers was evaluated quantitatively as the percentage of positive tumor cells over total tumor cells (%). A cutoff of ≥20% positivity was labeled as positive, whereas <20% was labeled as negative [Table 1]. SPSS software (17.0 version, IBM, South Asia Pvt Ltd, Bengaluru, India) was used for the statistical analyses. Chi-square test was applied to the sets of categorical data to evaluate the association between the variables. P ≤ 0.01 was considered statistically significant. The mean age of the presentation was 50.63 years (range: 20–78 years). There was a male preponderance with 19 male (63.3%) and 11 female patients (36.7%). There was a wide range in the duration of symptoms, varying from 7 days to 1 year. Nine (30%) patients presented with the clinical features indicating focal neurological deficits and raised intracranial tension (ICT). Seven (23.3%) patients presented with clinical features indicating raised ICT. Six (20%) patients presented with the clinical features, suggesting focal neurological deficits, raised ICT, and behavioral/neurocognitive changes. Three (10%) patients presented with the clinical features indicating raised ICT and behavioral/neurocognitive changes, whereas three (10%) patients presented with the clinical features, indicating focal neurological deficits and behavioral/neurocognitive changes. Two (6.7%) patients presented with the clinical features indicating focal neurological deficits. Overall, the most common location was basifrontal in 19 (63.3%) cases. All the patients underwent surgery, a near-total/gross total resection was achieved in 17 (56.7%) cases. Remaining 13 (43.3%) cases had a subtotal resection. All the patients were referred for the adjuvant therapy. In the follow-up, it was found that 28 (93.3%) patients went for radiotherapy/chemotherapy. Two (6.7%) patients did not opt for any sort of adjuvant therapy. Of the 30 cases, large areas of necrosis (>50%) were seen in 7 (23.3%) cases, whereas remaining 23 (76.7%) cases showed relatively less necrosis (<50%). Microvascular proliferation showing endothelial cell proliferation and glomeruloid tufts both were seen in 19 (63.3%) cases, while in 11 (36.7%) cases, only endothelial cell proliferation was observed. Twenty-four (80%) cases had mitotic count ≤5/HPF, while six (20%) cases had mitotic count ≥5/HPF [Figure 1]. In this study, three (10%) cases of giant cell glioblastoma were reported [Figure 2]. Additional features (including oligodendroglial and gemistocytic component) were present in 12 (40%) cases [Figure 3]. Of the 30 cases, 14 (46.7%) cases showed immunopositivity for p53 and 16 (53.3%) cases showed immunonegativity. Sixteen (53.3%) cases showed overexpression of EGFR, whereas 14 (46.7%) cases showed immunonegativity. Twenty-seven (90%) cases showed overexpression of VEGF and three (10%) cases showed immunonegativity. Ki 67 showed overexpression in 17 (56.7%) cases, while 13 (43.3%) cases showed immunonegativity. MDM2 was expressed in 22 (73.3%) cases, while 8 (26.7%) cases showed immunonegativity [Figure 4]. Multivariate analysis was done by applying Chi-square test to evaluate the correlation of survival with the clinical, histopathological, and immunohistochemical parameters. Age of the patient and expression of MDM2 were the most significant predictor of survival in this study (P< 0.001) [Table 2]. Glioblastomas are the most common and the most malignant of all brain tumors, characterized by genetic instability, heterogeneous histology, and unpredictable clinical behavior with a dismal prognosis. Survival of patients with glioblastoma depends on certain clinical, histological, immunohistochemical, and molecular variables. Over the years, some studies have highlighted the effect of clinical factors such as age, Karnofsky performance score (KPS), extent of surgical resection, and radiotherapy on survival. A study by Umesh et al. has analyzed clinical and immunohistochemical prognostic factors in adult glioblastoma patients. Few studies have incorporated molecular markers along with the clinical parameters to correlate them with survival. In the current study, the key clinical features, the major histopathological and relevant immunohistochemical parameters were analyzed and correlated with survival of the patients. The clinical variables in predicting survival in glioblastomas have been well defined in the past few years. Among the clinical variables, younger age has been unequivocally associated with a prolonged survival in many studies.,, Near total/gross total resection was another clinical variable associated with better survival in glioblastoma patients in many studies.,, In one study, clinical variables inclusive of age, KPS, and extent of surgical resection were the most significant prognostic factors influencing survival. In our study, among the clinical parameters, age of the patient emerged as significant prognostic factor as it showed a significant correlation with the patient survival (P< 0.05). A marginal correlation was found between the extent of resection of the tumor and patient survival; however, it did not show any statistical significance. Among the histopathological parameters, some studies have suggested that certain histopathological features in glioblastomas are associated with patients' clinical outcome, like the presence of necrosis has been considered a predictive factor for poor survival of patients with glioblastoma. In their study, Pierallini et al. reported that patients of glioblastoma showing necrosis in >35% of tumor had a significantly shorter survival time. A large population-based study by Homma et al. has shown no correlation between microvascular proliferation and patient survival in glioblastomas. Several studies have shown longer survival of patients with glioblastoma containing an oligodendroglial component.,, However, in contrast, He et al. reported that the survival of patients with glioblastoma containing an oligodendroglial component did not differ from those of patients with ordinary glioblastoma. Our study in discordance to the existing literature did not show any correlation with any of these features. Among the immunohistochemical markers, with regard to the significance of EGFR overexpression as a prognostic factor, several studies have shown variable results. Studies conducted by Heimberger et al., Cobbers et al., Rainov et al., and Waha et al. overall did not show any correlation between EGFR overexpression and survival,,,, while several other studies concluded that overexpression of EGFR is a negative prognostic indicator with respect to survival.,,,,, In a study by Montgomery et al., the authors had studied the prognostic correlation of p53 and MDM2 in 36 cases of glioblastomas and had found poor survival in cases that showed overexpression of p53 and MDM2. In contrast, in the present study, we found a positive correlation between MDM2 overexpression and the patient survival with no significant correlation between p53 overexpression and survival. There is a paucity of literature correlating the expression of Ki67 and VEGF with survival in glioblastomas. In our study, we did not find any correlation between Ki67, VEGF expression, and patient survival. In this study, among the clinical parameters, age of the patient, and among the immunohistochemical parameters, expression of MDM2 emerged as significant prognostic factors as both showed a significant correlation with the patient survival. A marginal correlation was found between the extent of resection of the tumor and patient survival. All other clinical, histopathological, and immunohistochemical parameters included in this study did not show any significant correlation with the patient survival. However, the small sample size remains a limitation of this study. Ostrom QT, Gittleman H, Liao P, Rouse C, Chen Y, Dowling J, et al. CBTRUS statistical report: Primary brain and central nervous system tumors diagnosed in the United States in 2007-2011. Neuro Oncol 2014;16 Suppl 4:iv1-63. Nobusawa S, Watanabe T, Kleihues P, Ohgaki H. IDH1 mutations as molecular signature and predictive factor of secondary glioblastomas. Clin Cancer Res 2009;15:6002-7. Kleihues P, Burger PC, Collins VP, Newcomb EW, Ohgaki H, Cavenee WK. Glioblastoma. In: Kleihues P, Cavenee WK, editors. World Health Organization of Classification of Tumors: Pathology and Genetics of Tumors of the Nervous System. Lyon-France: IARC; 2000. p. 29-39. Umesh S, Tandon A, Santosh V, Anandh B, Sampath S, Chandramouli BA, et al. Clinical and immunohistochemical prognostic factors in adult glioblastoma patients. Clin Neuropathol 2009;28:362-72. Jeremic B, Milicic B, Grujicic D, Dagovic A, Aleksandrovic J. Multivariate analysis of clinical prognostic factors in patients with glioblastoma multiforme treated with a combined modality approach. J Cancer Res Clin Oncol 2003;129:477-84. Laws ER, Parney IF, Huang W, Anderson F, Morris AM, Asher A, et al. 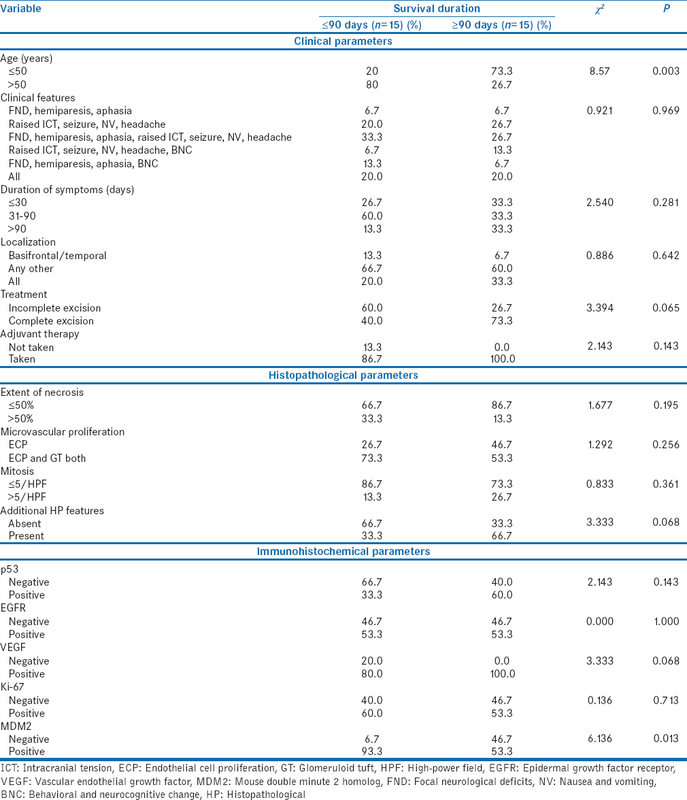 Survival following surgery and prognostic factors for recently diagnosed malignant glioma: Data from the glioma outcomes project. J Neurosurg 2003;99:467-73. Ammirati M, Vick N, Liao YL, Ciric I, Mikhael M. Effect of the extent of surgical resection on survival and quality of life in patients with supratentorial glioblastomas and anaplastic astrocytomas. Neurosurgery 1987;21:201-6. Kowalczuk A, Macdonald RL, Amidei C, Dohrmann G 3rd, Erickson RK, Hekmatpanah J, et al. Quantitative imaging study of extent of surgical resection and prognosis of malignant astrocytomas. Neurosurgery 1997;41:1028-36. Homma T, Fukushima T, Vaccarella S, Yonekawa Y, Di Patre PL, Franceschi S, et al. Correlation among pathology, genotype, and patient outcomes in glioblastoma. J Neuropathol Exp Neurol 2006;65:846-54. Pierallini A, Bonamini M, Pantano P, Palmeggiani F, Raguso M, Osti MF, et al. Radiological assessment of necrosis in glioblastoma: Variability and prognostic value. Neuroradiology 1998;40:150-3. Nelson JS, Petito CK, Scott CB, Rotman A, Asbel S, Murry K. Glioblastoma with oligodendroglial features radiation (GBM-OL): Report from radiation therapy oncology group (RTOG) trial 8302. Lab Invest 1996;74:141A. Hilton DA, Penney M, Pobereskin L, Sanders H, Love S. Histological indicators of prognosis in glioblastomas: Retinoblastoma protein expression and oligodendroglial differentiation indicate improved survival. Histopathology 2004;44:555-60. Kraus JA, Lamszus K, Glesmann N, Beck M, Wolter M, Sabel M, et al. Molecular genetic alterations in glioblastomas with oligodendroglial component. Acta Neuropathol 2001;101:311-20. He J, Mokhtari K, Sanson M, Marie Y, Kujas M, Huguet S, et al. 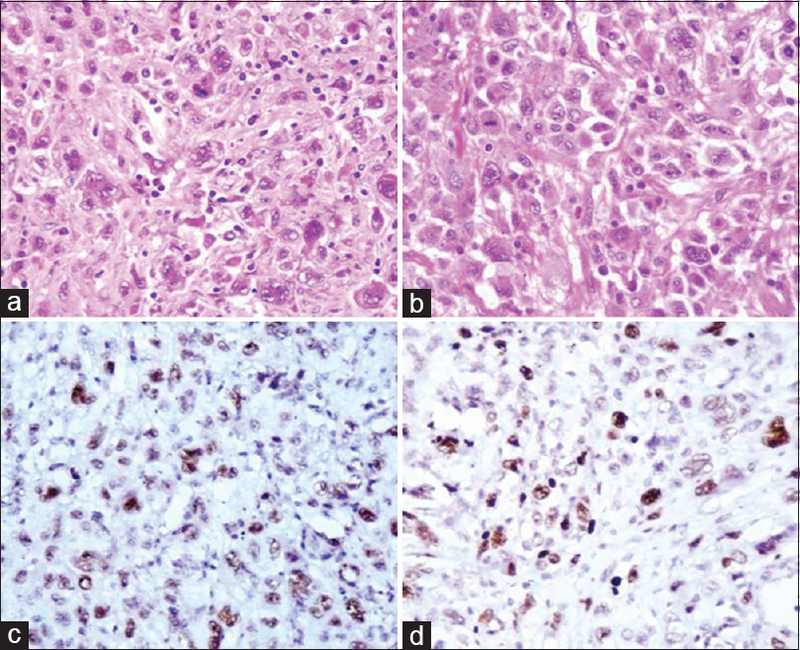 Glioblastomas with an oligodendroglial component: A pathological and molecular study. J Neuropathol Exp Neurol 2001;60:863-71. Heimberger AB, Hlatky R, Suki D, Yang D, Weinberg J, Gilbert M, et al. Prognostic effect of epidermal growth factor receptor and EGFRvIII in glioblastoma multiforme patients. Clin Cancer Res 2005;11:1462-6. Cobbers JM, Wolter M, Reifenberger J, Ring GU, Jessen F, An HX, et al. Frequent inactivation of CDKN2A and rare mutation of TP53 in PCNSL. Brain Pathol 1998;8:263-76. Rainov NG, Dobberstein KU, Bahn H, Holzhausen HJ, Lautenschläger C, Heidecke V, et al. Prognostic factors in malignant glioma: Influence of the overexpression of oncogene and tumor-suppressor gene products on survival. J Neurooncol 1997;35:13-28. Waha A, Baumann A, Wolf HK, Fimmers R, Neumann J, Kindermann D, et al. Lack of prognostic relevance of alterations in the epidermal growth factor receptor-transforming growth factor-alpha pathway in human astrocytic gliomas. J Neurosurg 1996;85:634-41. Etienne MC, Formento JL, Lebrun-Frenay C, Gioanni J, Chatel M, Paquis P, et al. Epidermal growth factor receptor and labeling index are independent prognostic factors in glial tumor outcome. Clin Cancer Res 1998;4:2383-90. Korkolopoulou P, Christodoulou P, Kouzelis K, Hadjiyannakis M, Priftis A, Stamoulis G, et al. MDM2 and p53 expression in gliomas: A multivariate survival analysis including proliferation markers and epidermal growth factor receptor. Br J Cancer 1997;75:1269-78. Shinojima N, Tada K, Shiraishi S, Kamiryo T, Kochi M, Nakamura H, et al. Prognostic value of epidermal growth factor receptor in patients with glioblastoma multiforme. Cancer Res 2003;63:6962-70. Smith JS, Tachibana I, Passe SM, Huntley BK, Borell TJ, Iturria N, et al. PTEN mutation, EGFR amplification, and outcome in patients with anaplastic astrocytoma and glioblastoma multiforme. J Natl Cancer Inst 2001;93:1246-56. Zhu A, Shaeffer J, Leslie S, Kolm P, El-Mahdi AM. Epidermal growth factor receptor: An independent predictor of survival in astrocytic tumors given definitive irradiation. Int J Radiat Oncol Biol Phys 1996;34:809-15. Montgomery RM, Queiroz Lde S, Rogerio F. EGFR, p53, IDH-1 and MDM2 immunohistochemical analysis in glioblastoma: Therapeutic and prognostic correlation. Arq Neuropsiquiatr 2015;73:561-8.